We’re on a roll with a string of great “praise” hymns. I love the little rhythmic difference in bar 2, the dotted quarter eighth figure. It fits the language so perfectly. And when the tempo is fast, which I really like, I can imagine a grand orchestra and timpani emphasizing the eighth and ending quarter of the bar. The fast tempo turns this into more than just a hymn of praise, it becomes like a dance. This reminds me of our barn dance way back in Hymn #3. Same meter. Same forward motion. Rather that start with a pickup, like Hymn #3, the strong syllable is the 1st syllable. So we start squarely on the down beat. Like other strong hymns of “praise” there is a large leap at the outset of the hymn. But this one is unique. First we get settled in with 2 tonic notes, 2 G’s before leaping up to high D on the weak beat of the bar and landing strongly on the down beat of the 2nd bar on the 3rd scale degree. I find it interesting that almost every available chord in the diatonic scheme of 7 chords is used in the first phrase. The only one missing is the 7 diminished chord. I love how the bass hops around, especially in the moment where it pivots around the C.
The second phrase, with identical music to the first, has a couple of my favorite scripture verses. First the Isaiah 41:31 reference in verse 2, and then a snippet from Psalm 23 in verse 3. Of course Psalm 23 is an ultimate favorite of many and it’s been set to music thousand of times. I wrote a setting of the whole Psalm in my cantata, The Good Shepherd. It’s a 8-part a cappella setting that I must say, I’m quite proud of. I poured a lot of emotion into that setting. Rather than starting in a happy place, then finding yourself in the “valley of the shadow of death,” the piece begins in the dark valley with repeated calls for help, “O Lord, O Lord, my Shepherd, my Shepherd.” The sheep is lost and cannot find her way. After many turns and climbs, she is finally led to green pastures with a big rapturous cleansing of her sins and the sun comes out in full force. Here’s a video of my favorite Episcopalian choir singing it. These are my dear friends at St. Thomas in Cincinnati where I am composer-in-residence. Anyway, back to the hymn. Sorry, I got a little side-tracked. Psalm 23 tends to do that to me. After 2 identical phrases, we get one more phrase broken into 2 parts. First, we have 2 grouping of 2 bars. “Join the great throng…” and “Psaltery, organ and song.” Again I’m hearing timpani and trumpet. The 3 quarters followed by dotted half slow down the forward motion a bit, but they are a nice set of “action” bars. “Join the great throng.” “Hast thou not seen?” “Ponder anew.” “Let the ‘amen.’” And in the midst of all that we get a quote from Psalm 150, a particularly powerful Psalm for musical setting because of the references to musical instruments. Normally this chord would lead to an E minor chord in this key. The D# acts as a leading tone to E and the E chord in this key is an E minor chord. However, the composer treats the B-major chord kind of like a neighbor tone. The soprano steps up to B and back to A, like running to the neighbor to borrow some sugar. The alto does the same, steps to the D# and goes right back to the E. The tenor and the bass do the same. So, I think we’re save to call this a chromatic neighbor chord. Kind of novel. This is a great classic hymn. We hear the Tabernacle Choir sing it quite a lot. I’m not sure how often it’s programmed in Sacrament Meetings. I would guess that most ward organists are a bit nervous about the constantly moving bass line. But it’s a keeper for sure! That’s all for today. Tomorrow we’ll have a look at a “praise” hymn composed by the chair of the 1950 hymnbook committee. P.S. Click here to subscribe. I’ll send you a little email with every new post. On the heels of All Creatures of Our God and King, this is another of the most prevalent hymns in Christianity. The tune is synonymous with the text, as the tune name is the first line of the text. 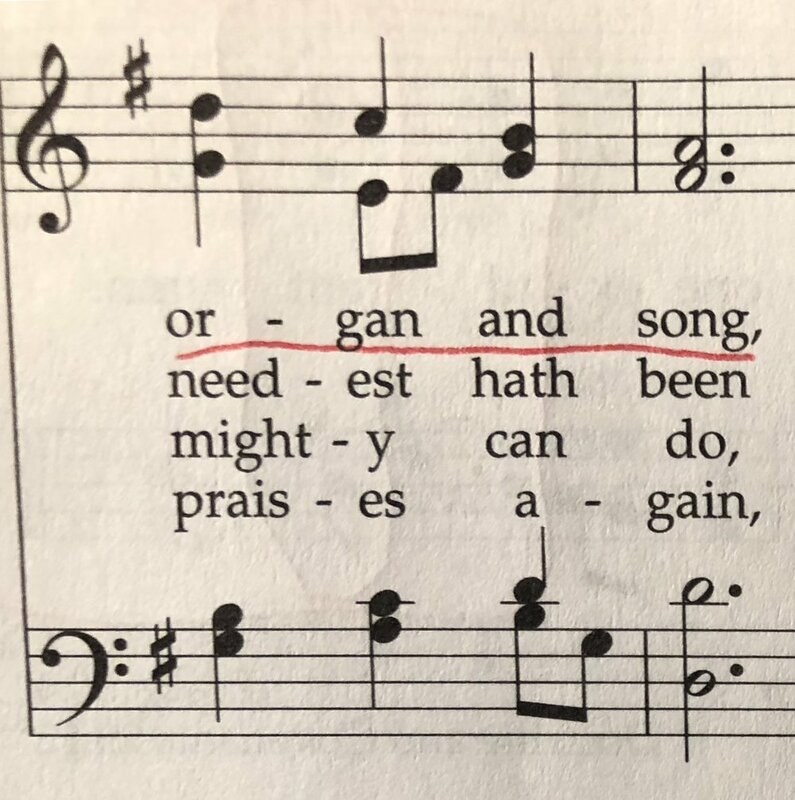 To see just how prevalent this hymn has been through the century, just look at the number of arrangements and compositions that use this tune at this website: http://www.ldsorganists.info/p.htm#k. This chorale really wants to move along in my estimation. It can really plod along and be pedantic if played too slow. I like a clipping tempo somewhere in the quarter note equal to 128-132 range. That seems to give the tune real energy and drive. You will notice that is significantly faster than the suggested range in the book once again (92 beats per minute, and even 112, is painfully slow). This hymn cries out for a strong, robust registration, employing chorus reeds with the principal chorus.